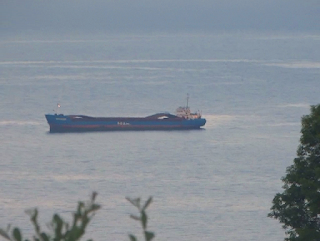 You may be wondering what the ship lying off Maidencombe for nearly a fortnight is doing there. The Antigua & Barbuda flagged general cargo ship Bounder is apparently 'awaiting orders', which covers several eventualities. The Sanko Mineral, anchored off Maidencombe off and on for over a year was also apparently awaiting orders until it transpired that the ship was at the centre of a legal dispute and could not continue to any port. The cargo vessel Bounder as seen on June 1st.